« How Many Points of View? Looking for the Wednesday Wandering? Page back one and get my point of view on, well… Point of View. 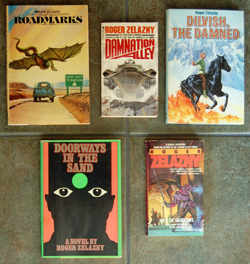 Then come and join me and Alan as we conclude our discussion of the novels of Roger Zelazny. By the way, tonight (Thursday, June 13th, 6:30 pm), I’m doing a book signing at Alamosa Books here in Albuquerque with Darynda Jones and Shea Berkeley. Hope to see some of you there! JANE: Well, Alan, in the best tradition of these Tangents, we’ve tangented off our discussion of various sub‑genres of Fantasy into a discussion of Roger Zelanzy, a writer of Fantasy and Science Fiction whose work we both enjoyed. ALAN: What about Roger’s Dilvish stories? I could never really come to grips with them. I’ve tried reading them several times but they always strike me as straight down the middle of the road fantasy novels with nothing especially outstanding or original about them. I’ve never managed to get more than two or three chapters into them. It seems to me that this world would have been an ideal place for Roger to explore his mythological themes from a less technological point of view, but I never saw any sign of that at all ‑ or indeed of anything else either. On the other hand, it may well be that I’m missing something important here. Roger was always a subtle writer, so perhaps I just haven’t spotted whatever it was he was trying to say. JANE: I like the Dilvish stories, but I don’t think I ever took them as anything more than some light sword and sorcery. Dilvish reminds me rather of the Grey Mouser from Fritz Lieber’s tales. However, those stories have a firm following. After Roger’s death, they were among those I was most often asked about. ALAN: Strange. They never attracted me at all. There’s a road that runs through time rather than through space and the travellers on can take exits to various historical periods. But history is mutable, and changes to it simply produce extra forks in the road, so there’s always something new to see. It’s full of Roger’s trademark humour. I love the idea of Hitler driving furiously up and down the road looking for the places where he won. And what about Mondamay, the futuristic but malfunctioning warrior robot whose major hobby and interest is pottery. And the cybernetic incarnations of Baudelaire’s “Flowers Of Evil” and Whitman’s “Leaves Of Grass” which talk and argue with the protagonist(s), constantly quoting from themselves. JANE: I liked Roadmarks quite a bit, although I never could quite believe Roger’s claim that the chapters that take place in various historical settings were arranged at random. They sure seem to have a logical development to me. However, maybe that’s a logic superimposed by this reader’s mind. Another of Roger’s odder books is Doorways in the Sand. It’s an amusing book. I especially liked the aliens. What do you think of it? JANE: I agree… Lovely stuff. ALAN: Fred’s hobby is climbing buildings. He loves high places. They soothe and comfort him when he is upset or worried. And, anyway, he finds climbing fun. It’s an odd sort of hobby to have. Did Roger have any personal connection with climbing or climbers? JANE: Not professionally or anything, but I’ve heard that back when Roger lived in the Baltimore area he’d often escape crowded parties by going out on a roof ‑ say where a porch jutted out and the roof could be reached by a second story window ‑ and sit there, smoking a cigarette and seeing what would happen. Often someone would join him and they’d chat. Jay Haldeman (brother to Joe and author under the name of Jack C. Haldeman) was one of the people who’d often join Roger on the rooftops. Since Jay was in many ways the model for Fred Cassidy ‑ he also spent a long time studying before taking his degree ‑ this connection seems pretty obvious. When Roger died, Jay came out to New Mexico for the memorial service. He was a lovely man, like Roger in that his seeming quiet held a lively intellect and a fine sense of humor. He said he’d dreamed of Roger on the night he died… I liked Jay a lot. His death a few years later was a real loss. ALAN: One day in a bookshop, I spotted a novel by Roger called Jack of Shadows. The title fooled me. I thought it was another Amber book (because of the reference to shadow) and so I bought it on the strength of that. In point of fact Jack of Shadows has nothing whatsoever to do with Amber. It is a pure fantasy novel (with a brief bow to “science” in that it takes place on an Earth that keeps one face constantly towards its sun). Magic rules and Jack of Shadows, Shadowjack the Thief, has broken the compact and duped the Lord of High Dudgeon (how does Roger consistently get away with such terrible jokes?). I never regretted my decision to buy it ‑ it is a wonderful book. Jack shines so brightly. He leaps off the page and demands that you hear his story. From the Dung Pits of Glyve (where the dead are regenerated) to the search for Kolwynia, The‑Key‑That‑Was‑Lost the inventiveness never flags. I think Jack of Shadows is my most serendipitous mistaken buy. JANE: I liked it, too. It could have gone the same route as the lighter “Dilvish” stories, but manages to have a bit more depth. Roger told me that he had a vivid image of the World Machine and not much else when he started the book, but he was confident there was a story there and went after it. ALAN: I didn’t realise there was a novella. I’ve only seen it as a novel. I thought it worked brilliantly. Didn’t they make a movie of it? JANE: They did, but it’s a movie I’ve never seen. Roger asked very little of me by way of restrictions, but once he jokingly asked me to never watch that movie, so I never have. A few years ago, I gave the VCR tape I had of it to Roger’s son, Trent, so I couldn’t give into temptation. ALAN: Probably a wise decision. I know we’re both fans and therefore biased, but I think that Roger’s books all stand the test of time very well indeed. The stories written by many of his contemporaries sometimes seem clunky and a little old fashioned to modern eyes. But Roger’s stories are just as fresh and as bright as ever they were. What do you think? JANE: Occasionally, as in elements of the setting of Doorways in the Sand, I do find the novels become dated. However, overall, I think they have held up very well. A few years ago, when the Chronicles of Amber were released as an omnibus, one of the most frequent comments I heard was a variation on “Those characters sure do smoke a lot.” At the time the stories were first released, social smoking was a part of the landscape. However, as I noted in the biography of Roger that I wrote back in the mid‑nineties, he never stopped growing and stretching as a writer, adapting to the world as it changed around him. But, sadly, he never got the chance… I’m happy that what he did write remains stories I can recommend to newer readers. Next time, let’s return to the sub‑genres of Fantasy. Something you said a while back has given me an idea where I’d like to go. This entry was posted on June 13, 2013 at 1:00 am and is filed under Other People's Stories, Thursday Tangents. You can follow any responses to this entry through the RSS 2.0 feed. You can leave a response, or trackback from your own site. Nice trip down memory lane. I read about half of those, mostly in my dad’s collection. The comment about smoking actually strikes a chord, because it’s one of those weird things that separates current fantasy from the fantasy of, oh, 30-plus years ago. As a non-smoker, I find it interesting trying to write something set in the 1940s: how much smoking to put in? I guess we’ve actually come far enough that it’s now a bit of an issue, trying to strike a balance between modern tastes and historical verisimilitude. That’s a really interesting item. Thanks for sharing it. Like heteromeles, I’m a non-smoker, so I’d be clueless as to how much to put in. I think I’d be guided by the character’s sensibilities… Would they think it worth mentioning? When those who wrote twenty or thirty years ago mentioned smoking, it would no more be “noticed’ by their readership than a mention of, say, rubbing one’s hands together. Today it would be disproportionately visible. I remember when I re-read _The Fellowship of the Ring_ some years ago thinking that it hardly made sense for the group to sneak around since any monster could track them by the smell of Gandalf and Aragorn’s pipes! I don’t smoke either – and never noticed how much of was going on in Schimtz’s books until Eric pointed it out. Nor did I think of your point about Gandalf & Aragorn – and the Hobbits – until now, despite the fact that Louis L’Amour makes a point of how Indians could track whites that way in more than one of his stories. Some folks may have missed (I almost did) Roger Zelazny’s 1971 non-SF thriller, “The Dead Man’s Brother,” not published until 2011 (by Hard Case Crime). It’s a blast from the past, too. The Deadman’s Brother will drive non-smokers mad as it has more smoking in it than any other novel I’ve ever encountered. It’s a true trunk novel that shows its age. Oh, and I’m re-reading the Sandow novels, Isle of Dead and To Die in Iltabar, where we have the weird habit of Sandow smoking both cigars and cigarettes — a habit that’s very uncommon.